NEWLY appointed NRL CEO Todd Greenberg has vowed to unify the rugby league community and get more people playing and watching the game. Greenberg takes over from David Smith, who resigned last October, after the ARL Commission interviewed over 30 candidates for the role. 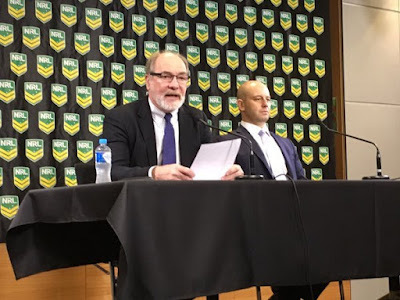 Previously the NRL’s head of football, Greenberg is seen as a football insider as opposed to former banker Smith who was often at loggerheads with the clubs. I have real clarity about what that looks like.”“We are at a key moment in the game’s history where we can bring people together,” said Greenberg. The former Canterbury chief executive outlined his key objectives as increasing crowds and viewership. “More people at stadiums, more people in their lounge room watching our broadcasts and particularly more people watching through our digital platforms,” he said. “If we get those two key priorities right we will absolutely achieve our potential. ARL Commission chairman John Grant said there were three key priorities when selecting the new CEO.